Confronting is defined as being able to face. When we say one is confronting, we mean that he is facing without flinching or avoiding. The ability to confront is actually the ability to be there comfortably and perceive. 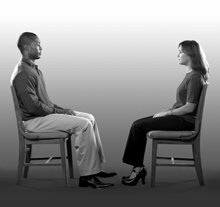 Position: Student and coach sit facing each other a comfortable distance apart—about three feet. Both are looking at each other. Purpose: To acquire the skill of being able to sit quietly and look at someone without strain. This drill is the next level of skill up from TR 0 Be There. Now he must also confront. Communication is not really possible in the absence of confront. Have you ever tried to talk to someone who won’t look at you? That person is not confronting you. Lack of confront is a barrier to real communication. Nervous twitches, tensions, all stem from an unwillingness to confront. When that willingness is repaired, these disabilities tend to disappear. Training Stress: Student and coach sit facing each other, neither making any conversation or effort to be interesting. They sit and look at each other and say and do nothing for some hours. Student must not speak, fidget, giggle or be embarrassed or fall asleep. It will be found the student tends to confront with a body part, rather than just confront. Confronting with a body part can cause the body part to hurt or feel uncomfortable. The solution is just to confront and be there. The basic rule is that anything which the student is holding tense is the thing with which he is confronting. If the student’s eyes begin to smart, he is confronting with them. If his stomach begins to protrude and becomes tense, he is confronting with his stomach. If his shoulders or even the back of his head become tense, then he is confronting with the shoulders or the back of his head. An expert coach would in this case give a “That’s it,” correct the student and then start the drill session anew. A blink is not a flunk on TR 0 and “blinkless” is not a requirement. The coach should not put any attention on whether somebody is blinking—only on whether or not the person is confronting. However, wide-eyed staring is unnatural and means the student is trying to confront with his eyes. In such a case the student’s eyes will water, become red and will hurt if he continues. A student having excessive trouble with his eyes should be returned to TR 0 Be There and master this drill before again attempting to do TR 0 Confronting. As with TR 0 Be There, the student does not use any system or method of confronting other than just be there. The drill is misnamed if confront means to do something to the person being confronted. The whole action is to accustom the student to comfortably being there three feet in front of another without apologizing or moving or being startled or embarrassed or defending self. Continue the drill until any twitches, flinches or other manifestations no longer exist or have to be suppressed (kept from being known or seen). Anything that turns on will flatten. Student passes when he can just be there and confront and he has reached a major stable win. the accomplishment of any desired improvement. Examples of wins would be a person increasing his ability to communicate, experiencing an increased feeling of well-being or gaining more certainty about some area of his life. In Training Routines, when a student has reached the point where he can do a drill and his skill and ability to do it is stable, it is called a major stable win—a significant, lasting gain.